It was hard to tell if Rich Chigga’s 2016 hit “Dat $tick” was a joke or not. His bars about seriously killing people with his “stick” while sporting a pink polo and Reebok fanny pack was understandably confusing to all those willing to watch the video. To further the confusion, Ghostface Killah hopped on the remix giving it a distinguished yet puzzling stamp of street credibility. As the years have rolled by, the game has gotten to know Rich Chigga (now officially Rich Brian) and in no way, shape or form is he about that life. When explaining to Genius the menacing lyrics of “Dat $tick,” Brian claims they were chosen simply because they “sounded cool on the song.” It isn’t such a shocking reveal based on his ambiguous look and overnight explosion but nonetheless a divulgence that proves unsustainable when trying to make lasting music. His debut album, Amen, is, however, a positive pivot towards permanency for the 18-year old Indonesian rapper. The 14-track LP is candid and much more reflective of who Brian Immanuel is as a person and as an artist. If anything, Rich Chigga and “Dat $tick” served more as an alter ego, or better yet a ghost of trapper-wannabe past, while the artist who appears on Amen is pleasantly true to self. Lead single “Glow Like Dat” is a snapshot sample of how Brian executes the lyrical stylings on the bulk of the album. His everyman break up gets detailed with lines like “Thinkin’ ’bout the times when you would go into my house/Had to let you go like that, I’d say it fucked me up/You live in my head without a doubt/Always anxious, got your picture on my necklace”. A similar bluesy feel appears on the Joji assisted “Introvert” as Brian goes into depth about the “hole in my soul” and other sad boy musings. One half of the album has Brian wrapped up in an emotional Mr. Lonely aesthetic while the other portion has him reaching for a small dose of unusual braggadocio to balance things out. Instead of flexing watches or lamping in mansions, Brian bigs up U.S. immigration visas and cryptocurrency investments. “Tresspass” bodes “Yes, lawd, bought some Bitcoin, was ’bout to buy some more” while “Occupied” even concludes that “Never like to brag, but I do it in my raps,” all of which adding to his peculiar sense of decency. The underlying theme borders on mildly corny but is undoubtedly more digestible than anything Rich Chigga would have put out. There is by no means dazzling wordplay, vivid storytelling or smash hits to be indulged through Amen but there are some strong beats courtesy of the man himself. Brian produced the entire album himself with a little help from Cubeatz and OZ on “Attention.” The kaleidoscope of production is freshly tailored to Brian’s equally mixing moods with trap drums helping the crypto flexes and somber keys leading the way for the emo-pop ballads. It’s the exact musical buffet that the majority of 18-year-olds would eat up 2018. After listeners accept their come-to-Jesus moment and accept a full album by the guy who made “Dat $tick,” the final sermon reveals Amen really isn’t that bad. 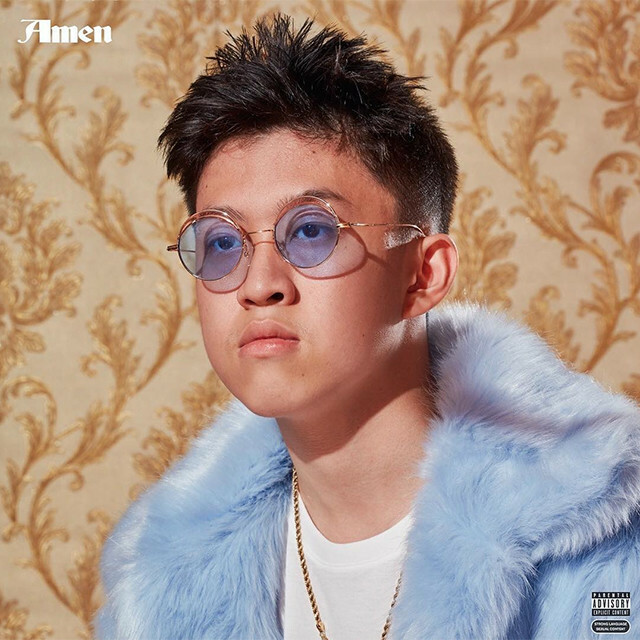 Rich Brian’s attempt at honesty throughout the album forebodes critics from outright clowning him while the beats are definitely catchy enough to keep his live shows rocking like a pulpit. As long Rich Brian remains in the driver seat and Rich Chigga in the trunk, Brian Immanuel’s future will bright.